Adswood’s local Councillor Ann Smith has scored a success in her campaign to stop cars parking in the Bus Stop in the centre of Adswood. It is illegal to park in the Bus Stop and causes inconvenience to other drivers as well as residents whop use the buses that serve Adswood. Ann, who lives up the road in Bridgehall, is just a short walk from the shops and sees the problems cars parking in the Bus Stop creates. “This causes all sorts of problems for everyone else and I know a lot of residents, shop owners and bus users feel quite strongly about it,” she said. As a result of her action Stockport Council has recruited six new traffic wardens. Their job is to make sure the rules are being enforced locally. Ann has told residents to contact her if cars continue to park in the stop. Davenport’s Lib Dem Councillor Ann Smith has written to residents in Davenport about her campaign to stop a proposed reduction of the service at Davenport train station. Users of the station have a train every half an hour to either Manchester Piccadilly or Buxton between Monday and Saturday. But Labour-run Transport for Greater Manchester has proposed reducing the service to Davenport on the Piccadilly-Buxton line to one train per hour in an effort to increase the speed of the service to Buxton. This is despite residents of Davenport, Cale Green and Shaw Heath using the service more and more, with numbers of users of the station growing by more than 89% since 2005. Local residents have been critical of Davenport’s Labour Councillor, David White. They are asking what the Reddish-based councillor has been doing on the issue of the reduced service as he sat on Greater Manchester transport committees until recently. Ann has written to Davenport residents saying that she is going to fight the proposals. She has initiated a petition residents can sign to make sure their voice is heard and that TfGM knows that the station is well used by local residents. “If residents sign the petition I can show Transport for Greater Manchester that enough residents care about the service, and we will have a better case to stop our service being cut,” said Ann. Residents who want to have their say can e-mail their contact details to petitions@stockportlibdems.org.uk and their names will be added to the petition. Councillor Sue Derbyshire has arranged a public meeting for local residents to discuss the future of the Woodbank nursery site. 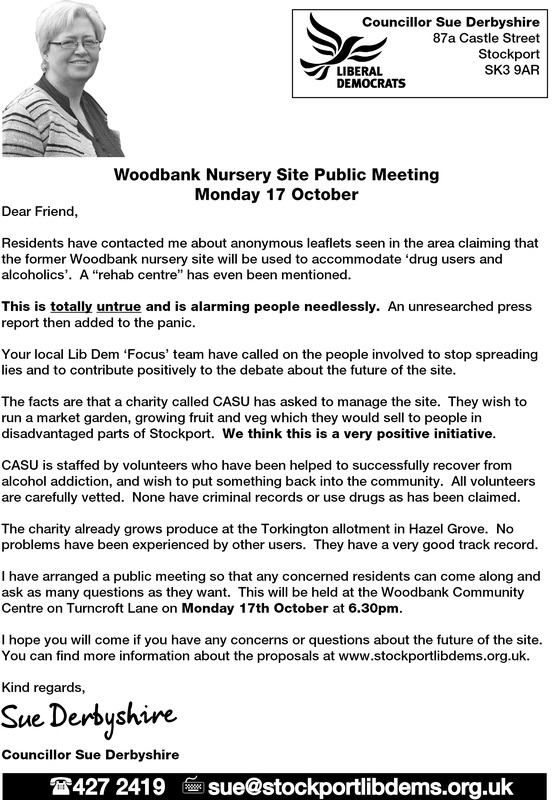 The meeting comes after anonymous leaflets were seen in the area claiming that the former Woodbank nursery site will be used to accommodate ‘drug users and alcoholics,’ claims that Sue has described as “completely untrue”. She has called on the people involved to stop spreading lies and to contribute positively to the debate about the future of the site. Local charity CASU are looking to run a market garden on the site, growing fruit and veg which they would sell to people in disadvantaged parts of Stockport. The charity is staffed by volunteers who have been helped to successfully recover from alcohol addiction and wish to put something back into the community. The meeting will be held at the Woodbank Community Centre on Turncroft Lane on Monday 17th October at 6.30pm. Residents who are interested in reading the Council report regarding the Woodbank Community Development can read this here. Stockport residents are being invited to take part in a consultation regarding the Council’s budget for next year. The proposals for the budget for the year 2012-13 have been made earlier than usual so that local residents, businesses, trade unions and other local organisations can have their say on the plans that protect frontline services, including no closed libraries, parks or children’s centres. This commitment to local services is in stark contrast to the local authorities near to Stockport, where deep cuts to services are being made. Rochdale Council is making 160 compulsory redundancies, a third of all Bolton’s libraries are set to be closed and Manchester is cutting more than a quarter of its children’s services, despite having £100 million sat in its bank account. While the Lib Dems at the Council are consulting taxpayers and local business about their plans, Stockport’s Labour councillors have refused to reveal their budget proposals to voters. And Labour councillors have been accused by the government of “playing politics” with the services used by vulnerable people – cynically slashing services in the hope voters will lay the blame at the coalition government, despite everyone knowing that a Labour government would be making almost identical cuts at a national level. Cllr Derbyshire said: “As we have done previously, we will do everything we possibly can to minimise the effects of the budget reductions on the people of Stockport and the council’s workforce. Residents can click here to have their say in the consultation which is open until 22 November. Stockport Lib Dems are letting residents know about the impending night time closure of a section of the M60 motorway. The closure is because Network Rail is undertaking maintenance work on the famous Stockport Viaduct. 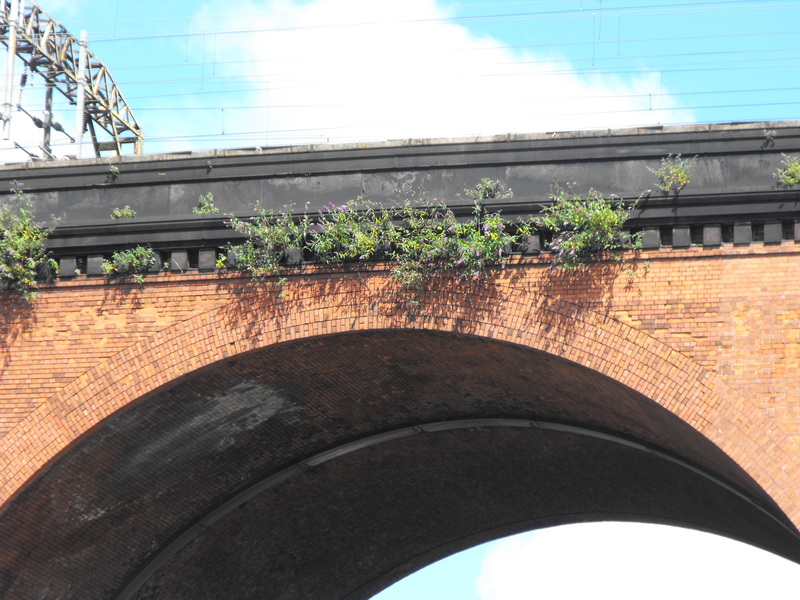 Part of the work is to remove vegetation which has been growing from the viaduct, something local Lib Dems have been campaigning to remove for some time. The motorway will be closed on the clockwise section between Junctions 26 and 1 and anti-clockwise between Junctions 1 and 27 during the hours 10.00pm-5.00am between October 3rd-31st. The work is being carried out at these times to avoid disruption during the day. As summer draws to a close the local Lib Dem team are already preparing for next winter in Stockport and are encouraging residents to take advantage of the free cavity wall and loft insulation campaign that the Council is helping to co-ordinate in Stockport. One of the biggest challenges residents are facing is with the rising cost of energy bills. 99 per cent of Britain’s energy is supplied by just six companies, and the sources of our energy remain fossil fuels that leave us hostage to global energy markets. But Lib Dem councillors are getting behind the “Get Me Toasty” campaign which was launched by the Council today alongside the Energy Saving Trust and British Gas. This is offering free cavity wall and loft insulation to ALL owner occupiers and privately renting residents in Stockport regardless of age or income subject to a survey. 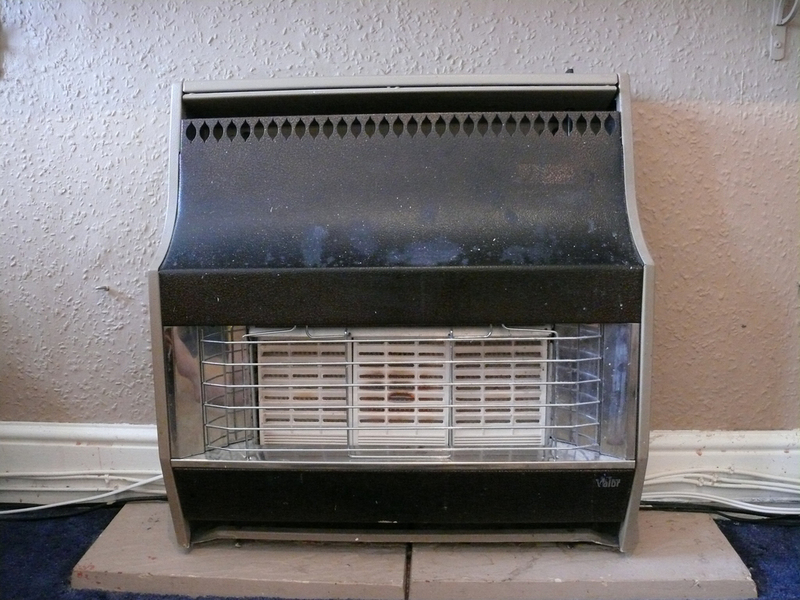 Residents who are interested in the scheme are encouraged to call freephone 0800 512 012 or view the ‘Get Me Toasty’ website for more information.